Tết – the Lunar New Year! And this year marks the Year of the Monkey….the Fire Monkey. Which means if you were born the years of the Dragon, Snake or Ox — good things should be coming your way. As for me, I’m of the Horse and as long as nothing “ominous” is slated, I’m totally good with that. 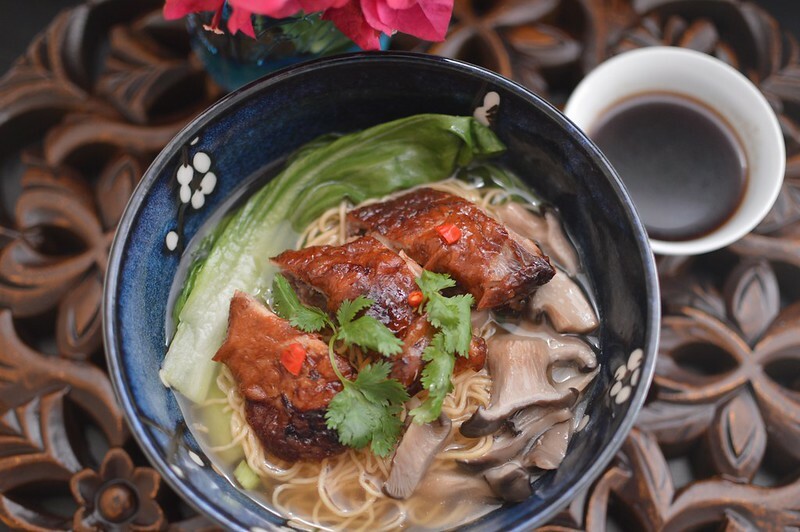 In honor of Tết, I decided to share with you a “short-cut” version of Roast Duck Noodle Soup. What’s the short-cut? I run out to Sam Woo BBQ to pick up one of their roast ducks! And I’ll be honest with you, there’s not one part of me that feels bad doing it either. Their Cantonese style ducks are stuffed with bean paste, scallions and MAGIC….before getting a shellac of a honey mixture to get the skin crispy and brown. The duck is then chopped up and served with either a plum sauce or a dark dipping sauce that at first glance looks like an oily soy sauce. But it’s more of a rich, umami filled broth. DEFINITELY ask for extra because that’s what I add to the soup to give it some extra OOMPF! No Sam Woo BBQ in your area? BUMMER! But any local Chinese BBQ spot – or even restaurant, will do the trick. Just be sure to ask for the broth-like dipping sauce. 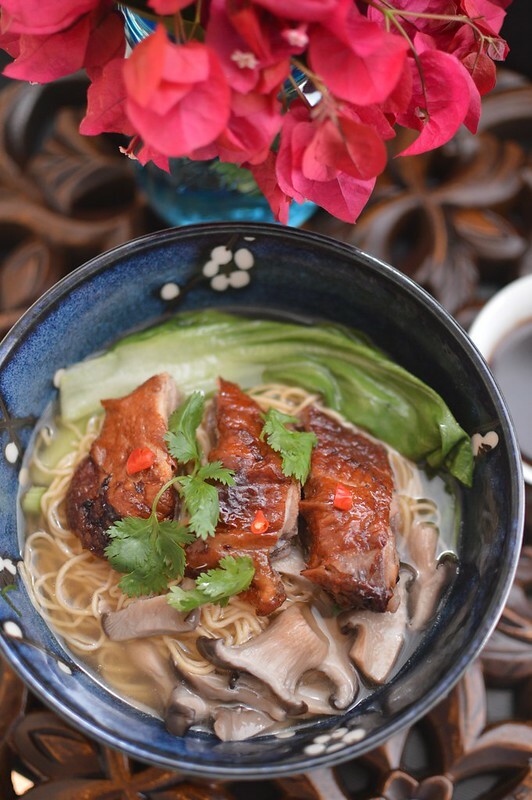 In addition to the dipping sauce, the soup consists of stock (duck -if you have it, otherwise chicken is fine), toasted spices and aromatics, as well as a few pieces of the roast duck. I usually just throw in the wings and duck head since I’m not one to gnaw on either of those parts. After the soup simmers for some time, it’s ladled over some egg noodles, bok choy and served with pieces of the roast duck. Easy Peasy! 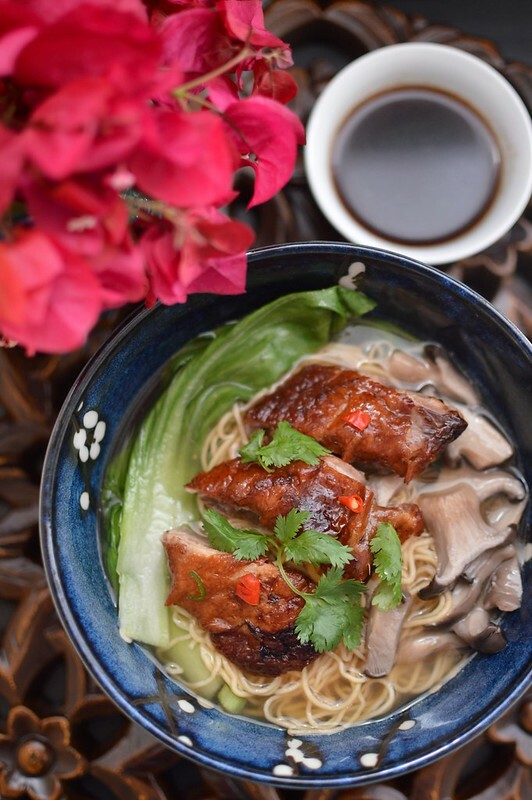 The dish is my quick nod to Mì Vịt Tiềm – which is Vietnamese Roast Duck Noodle Soup. However, since the duck isn’t marinated in Five Spice, the soup and duck itself isn’t as dark as traditional Mì Vịt Tiềm. It’s also doesn’t have the deep flavor that Five Spice imparts which is why I like to make a spice sachet of toasted anise, coriander, black pepper and cinnamon to mimic it. Once again Friends, let me say Chúc Mừng Năm Mới!! Place the star anise, cloves, cinnamon, coriander and peppercorns in a small skillet. Over low heat, toast the spices for 2-3 minutes; frequently shake the skillet to toss the spices. You’ll want to toast them until they’ve browned but not burned. Transfer the spices to a small plate to cool completely. Once they’ve cooled, place them with the bay leaves in the center of a square piece of cheesecloth. Gather up the edges of the cloth and tie it into a bundle with kitchen twine. Set aside. Using tongs to hold the onion, carefully char the exterior over an open flame of your stove burner—rotating the onion to char evenly. Set aside and repeat with the ginger. This can be done under the broiler of your oven as well. Pour the duck stock, water, about a cup of the duck dipping broth/sauce and sachet of spices into a large pot. Add the duck wings, duck head (if included), charred onion, charred ginger and garlic into the pot and bring the liquids to a boil. Lower the heat and simmer for 30-45 minutes, periodically skim off and discard any impurities that may have formed. 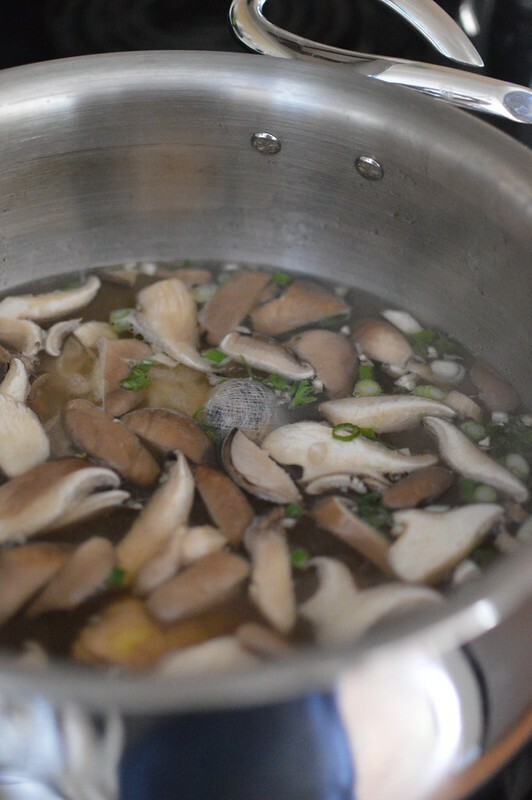 Stir in 1-teaspoon salt, 1-tablespoon fish sauce, 1-tablespoon Maggi and add the scallions and mushrooms. Simmer for another 15-20 minutes. Bring another large pot of water to a boil. Boil the egg noodles according to the package until al dente. Remove the noodles from the pot (save the boiling water) and drain in a colander. Divide the noodles amongst six bowls. Drop the bok choy into the boiling water and stir around for 30 seconds. Remove the bok choy and divide amongst the bowls. Taste the broth and add additional fish sauce or Maggi as needed. Bring to a rolling boil and then ladle the broth into each bowl. 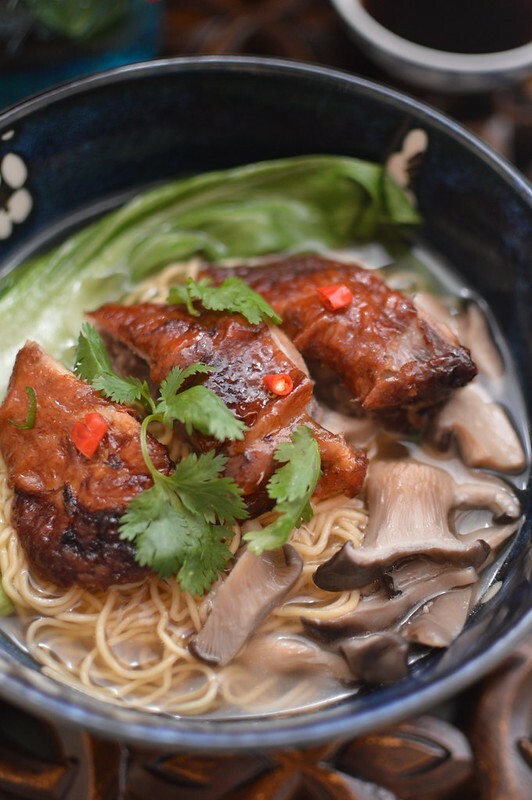 Top each bowl with mushrooms and a few pieces of roast duck. Garnish with cilantro and chilies. Serve immediately with a dish of the remaining dipping broth/sauce. Sorry Barry! The widget for a print button is no longer active on the site. I will be merging to a new platform at the end of the year–and the print button will definitely be on it! Thanks for stopping by!